Barre workouts are trendy now, and a popular way for a number of celebrities to stay in shape. However, many people are surprised to learn that this full-body workout is not new. For over 50 years, barre classes have been helping both men and women attain higher levels of fitness. Dancer Lotte Berk first developed the barre method when she suffered a back injury. By combining her ballet barre training with physical therapy, she was able to recover and get stronger. She opened her studio, The Lotte Berk Method in London in 1959. Her method came to the US in 1971 when one of her students, Lydia Bach, opened The Lotte Berk Method in New York. According to Bach, the benefit of barre workouts is how they balance toughness and safety. People who participate in barre classes are able to push themselves with less risk of injury than in other high-energy workouts. Since its beginnings, barre workouts have been known for their ability to provide toning and flexibility in a fun setting. 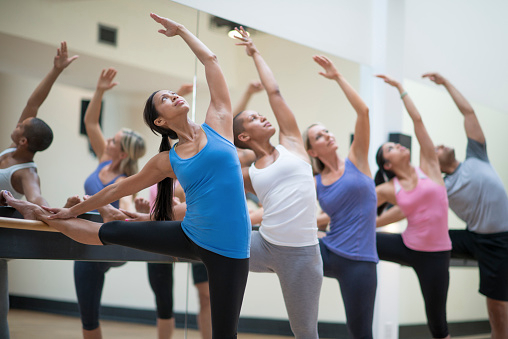 The combination of ballet moves, yoga and pilates creates a highly effective workout. Instructors have a great deal of flexibility and will add their own unique spin on this well established and effective form. As the workout has developed over time, it has benefited from the input of sports scientists and modern exercise efforts to make it more effective. The ballet barre pilates studio looks like a traditional dance studio, with barres along the walls to help you balance and open floor for other activities. Shoes are not worn in class; typically, participants will be barefoot or wearing grip socks or ballet shoes. he barre exercises help you develop your core muscles. This helps you burn fat, improves your posture and can make you more effective in your everyday life. Whether you are engaging in another athletic activity, in the middle of a fast paced day at work or making the most of a day off, your barre training will give you a boost. Our barre classes use modern, high paced music to get you moving. Intervals of strengthening and lengthening exercises help you flatten your stomach, lift your bottom, tone your airs and develop shapely thighs. The class is challenging, but addictive. Each time you practice the movements, you build the strength and endurance to make it easier next time and to give yourself the ability to move up to the next level. Barre has the power to help you feel changes in your body right away. Over time, you will see your body improve and feel stronger, sexier and more confident. Book a class today.